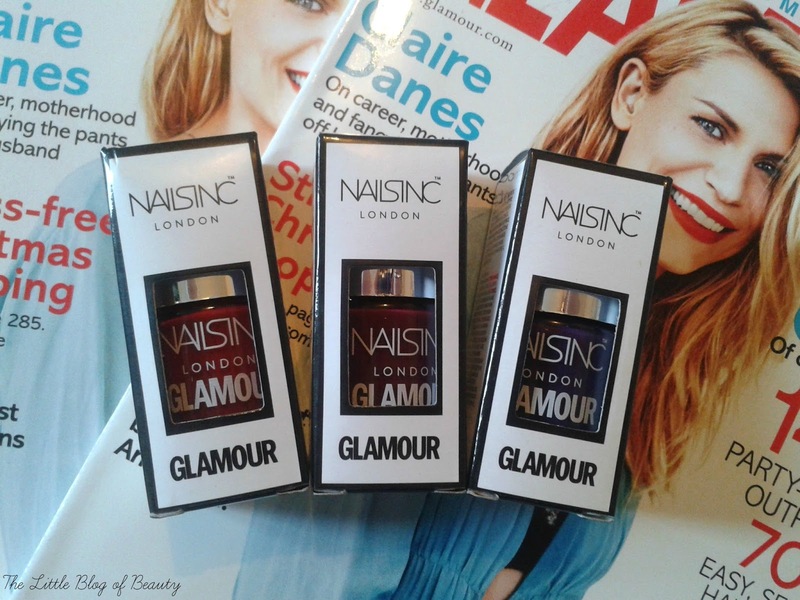 I'm sure you're probably all aware by now but December's copy of Glamour magazine comes with a free full size Nails Inc nail varnish worth £11. There are four shades to collect and as I've picked up three of them I thought I'd do a quick post so you can decide if you want to try and grab any if you haven't already. Although I did go to four different shops to find these it was no hassle as I picked up one while doing the food shopping (Tesco) and the others while I was shopping in town (WH Smith and Wilkos). There was a good mix of shades across the shops (there isn't one or more elusive shade(s) that you can't find anywhere *coughs* chubby sticks) and I think actually I only needed to go to three shops as I didn't realise how similar two of the shades can look in the boxes so I thought it was the one I'd already got. A little tip, to check the shade name on the bottle just squeeze the sides of the box slightly towards the bottom and it lifts the front a little so you can just see the name. The shades available are Tate (a deep red), Hanover Square (deep plum), Wigmore Street (deep blue/purple) and the one I don't have as I wasn't keen is Marylebone Mews (lilac grey). I love that Glamour offer this gift every year and although I wasn't very keen on last years shades I think this years are spot on, particularly Wigmore Street which is a really quite unusual dark purple, almost blue. 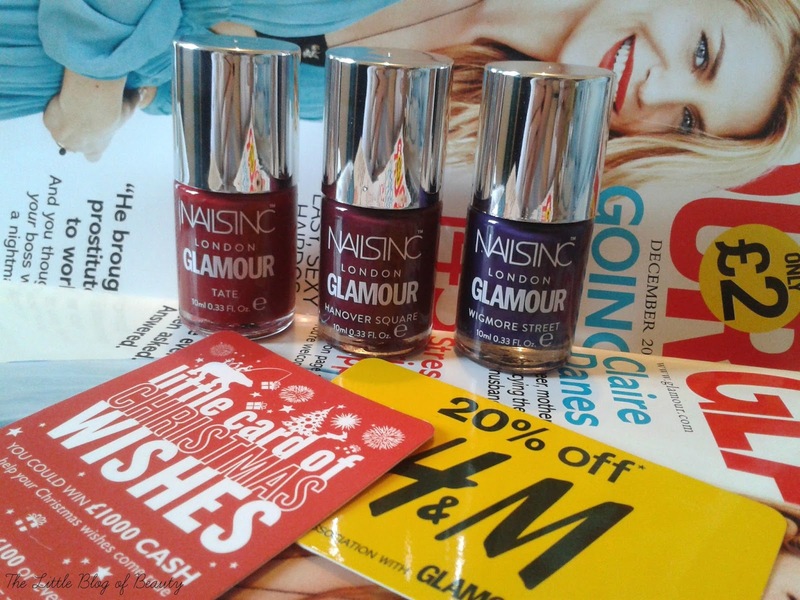 As well as the free Nails Inc varnishes in each copy you'll also get a 20% discount to use in store at H&M (valid until 5th Dec) and you should also get a The Body Shop 'Little card of Christmas wishes' card which is worth either £3, £15 or £100 and also enters you to win £1000 cash. The reason I say you should get one of these cards is because out of the three magazines I bought only one actually included a card and it sounds like several people have reported these missing. I'm a huge Body Shop fan and there are several cheaper products I wanted to pick up with these cards, so I'm really disappointed. Will you be grabbing any of these shades? I can't wait to pick one of these up; all of the nail polishes are so pretty but I think Tate is my favorite. :) It's a shame that some of the TBS cards are missing though!